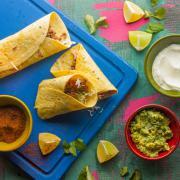 We've had lots of fun in the Spicery Kitchen with these new recipes, and we're sure you're going to love them! Happy with the whole experience so far and can't wait for next months kit! These were the most delicious meals that I have cooked at home. Really easy and fun to make! Goods were delivered timeously and packaging of gifts was very well presented in lovely boxes. The individual recipes ordeed were in a cloth gift bag which was very well received. It wasn't absolutely clear when you're buying a gift and when you were buying it for yourself. when the box arrived I wasn't sure if there was a nice internal box or if I should leave it in the external packaging.